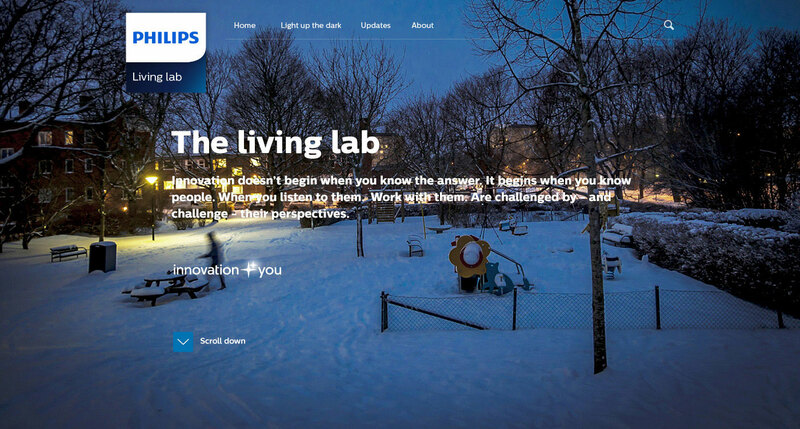 Through our partnership with Fleishman Hillard SA, Philips Europe asked Brave to create a microsite with a strong narrative feel to illustrate and explain their ‘Light Up The Night’ campaign. In Uppsala, Sweden, darkness falls early in winter. This means children have only a few hours of daylight each day to go out and play. So, Philips launched an experiment using their innovative Connected LED-lighting, Philips CityTouch, to see if they could give a class from a local primary school more time to play outside. To retain a narrative structure, we used a long-form design that would lead users through the story as they scrolled down the page. Taking Philip’s strict CI and web guidelines into account, we designed and built an eye-catching and easy-to-use microsite which delivers a powerful impact. The microsite includes placeholders for ‘future experiments’, Thinglink integration, and a ‘user generated content’ gallery that pulls in moderated #lightupthedark content from social media.